Our knowledge about the world seems to be highly fragmented. An ever expanding range of ever more narrowly focused disciplines has proliferated in recent decades, and professional jargon become ever more arcane. Specialists in each of these narrow disciplines often have very little idea what is happening in most of the others, simply because it’s not possible to keep up with everything. In the face of this balkanisation, it is all too easy to simply give up all hope of understanding more than an infinitesimal amount of what is understood. And yet, some of us refuse to give up that hope, and still believe in the great Enlightenment dream of the essential unity of learning. One such person is the biologist Edward Wilson. In his book Consilience, Wilson argues powerfully for the unity of the physical and social sciences, the humanities and even the arts. His central idea is the eponymous concept of “consilience”, which is the interlocking conceptual coherence of explanations from different branches of knowledge. In the first part of the book, he traces this idea from the “Ionian Enchantment” of ancient Greek science, through its apotheosis in triumph of Reason during the Enlightenment itself to its seeming fall in the Romantic reaction and today’s fractured academy. Then, having described how knowledge has fragmented he explains in great detail how we can put it all back together again. His primary methods are “consilience by reduction” and “consilience by synthesis”, which are two approaches to linking different levels of explanation. In the former, a complex phenomenon is dissected into simpler parts which can be separately understood. In the latter, the complex phenomenon is understood by building it up from simpler parts described by another discipline. One example of this process is the understanding of cells in terms of biomolecular machinery: the reduction of biology to chemistry. Reductive consilience is clearly a much less formidable problem than synthetic consilience, and Wilson’s ultimate vision is the reductive vision of a web of causal explanations for phenomena that would enable us to trace back any explanation all the way back to where it is ultimately anchored in physics. This is, of course, the currently somewhat unfashionable idea of Reductionism, and Wilson is unashamedly a reductionist. More than just a reductionist, however: Wilson is a reductionist of almost breathtaking ambition. 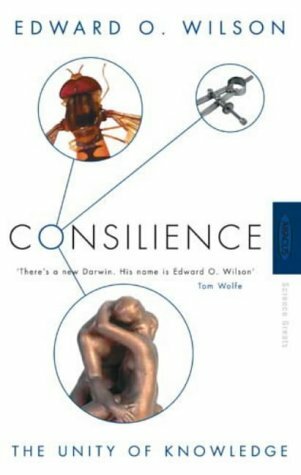 The bulk of Consilience is a sketch of how we might extend the web of consilient explanations far beyond the physical sciences to evolutionary biology, cognitive science, the social sciences, the arts and even to ethics and religion. All of this he approaches with great enthusiasm, and great respect both for those working beyond his own field of evolutionary biology and the profoundly difficult problems with which they grapple (indeed, he even has kind words to say about postmodernists; I doubt they would be so kind about him). In traversing this vast terrain, a few key ideas emerge over and over again. One is that human cognition is an adaptation shaped by natural selection: humans have a nature, it is not infinitely malleable by culture, and it can be understood through the application of evolutionary theory to psychology. Another is that there is a co-evolution of genes and culture: not only does the evolved nature of the human brain affect the development of culture, but cultures form part of the environment against which genes are selected. Wilson thinks (in my opinion correctly) that such ideas could form a bridge across the gulf that separates the natural and social sciences. He thinks that this gulf is an exciting frontier at which to work from either side. He also thinks that social scientists will have to rebuild their theories on more solid foundation of modern cognitive psychology to cross the divide. Whether social scientists will consider this an incursion to be resisted or an interesting challenge remains to be seen. When it comes to art, religion and ethics, Wilson’s ideas are more tentative and, I think, considerably less successful. His proposed approach to the arts is to try to explain why they evolved in the first place and why people have certain aesthetic preferences by reducing aesthetics to a set of epigenetic rules. This seems to me to be somewhere far short of incorporating the arts themselves into a consilient framework. Instead it is a possible approach to the incorporation of theories of art into a consilient framework. (I shall have more to say on such matters when I discuss the relationship of forms, context, science and design in a future article.) When it comes to ethics, he is on even shakier ground because he falls into the naturalistic fallacy, the idea that what is natural is also moral. It seems to me, however, quite clear that understanding why people have evolved to have various innate moral sentiments and the historical reasons for the development of certain systems of moral and ethical reasoning is a very different problem to moral or ethical reasoning itself. Indeed, the difficulties here are entirely analogous to those in the discussion of the arts. It’s hard to see how subjects that are fundamentally not about explanations can be smoothly incorporated into a web of explanations. There is obviously much more work to be done in sharpening the idea of consilience in these fields and, to his very great credit, Wilson never claims otherwise. Nevertheless, despite these difficulties Consilience is a fine, provocative and endlessly entertaining book. Love the review. BTW, a variant of the "naturalistic fallacy" is used with herbal medicine -- namely "that which is natural is also healthy/safe". Great to have a label for a common error. Do you know of a catalog of such fallacies? A quick google search did not bring anything up, but if you can think of 2-3 different fallacies of this sort I bet we could find a catalog page. There's a list of logical fallacies at Wikipedia. About Wilson, it must be said: If one must fail, at least fail spectacularly. I really liked the review. Where you had beefs with his treatment of ethics and art, I have a beef with the idea (which is not exclusive to Wilson) that evolution will provide us with any real insight in the cognitive sciences. Naturally, evolution provides constraints on any theory of cognition, in the sense that we can't theorize cognitive abilities or mechanisms that couldn't have come about through physical evolution. However, it's not clear to me that evolution theory has anything else to offer the study of cognition. This is not only because we do not have a great deal of information about the brain during evolution, or even the sorts of physical and cultural constraints that might be involved, or because contemporary evolutionary psychology has been largely composed of speculation and "just-so" stories. It's also because we can, using neuroscientific and other experimental methods, look at how cognition is now without taking evolution into account (in a positive sense). Even problems like modularity (which evolutionary psychologists think they have the answer to) can be explored through experimentation that doesn't take into account evolutionary hypotheses. Ultimately, then, it seems to me like evolutionary explanations for cognitive phenomena are superfluous from the standpoint of cognitive science. If one is a reductionist, this sort of superfluity is to be avoided, and even if one isn't, it makes little sense.